Incidence of congenital cardiac anomalies in dextrocardia with situs inversus is low as compared to congenital cardiac anomalies in isolated dextrocardia. Rheumatic mitral valve stenosis (MS) with dextrocardia and/or situs inversus has been described in the literature. We describe the first ever case of situs inversus with dextrocardia, Lutembacher's syndrome and pericardial effusion. A 40-year-old female presented with complaints of dyspnea and palpitation on exertion since 1 month prior to admission, which had been insidious in onset and progressive. There was no history of orthopnea or paroxysmal nocturnal dyspnea. There was a history of occasional retrosternal chest pain, nonradiating and anginal in character. On examination, she was pale, had a pulse of 88/min, which was regular, with average volume, blood pressure (BP) of 110/80 mm of Hg. Her jugular venous pulse (JVP) was normal; also, there were no signs of congestive cardiac failure (CCF). On cardiovascular examination, the apex was present in the 6th intercostal space (ICS) on the right side, lateral to mid clavicular line; right parasternal heave and diastolic shock were also present. First heart sound was loud and there was a wide, fixed split second heart sound. There was a mid diastolic murmur present at the apex and a systolic murmur present at the right parasternal area at the 3 rd -4 th ICS. There were no rales or wheeze on auscultation of lungs. There was no hepatomegaly or pedal edema. A chest X-ray was done which showed a right-sided cardiac shadow with presence of cardiomegaly. 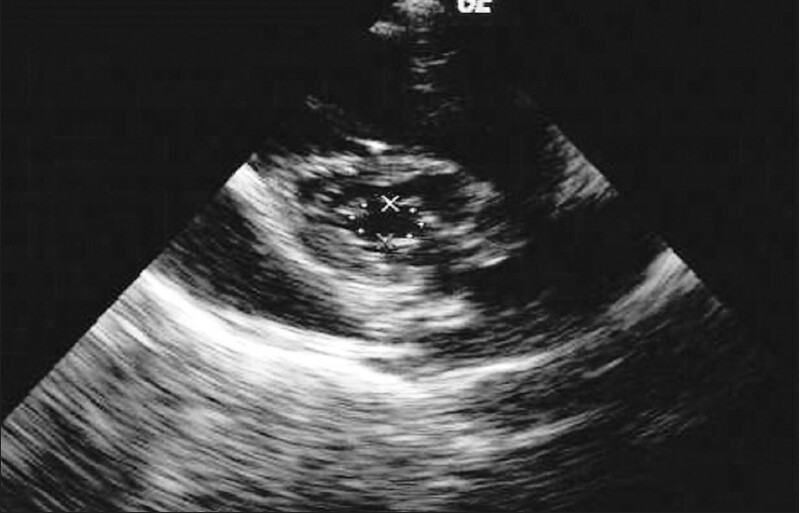 2D echocardiography revealed dextrocardia, situs inversus, concordant atrio-ventricular (AV) connection, large-size (12 mm) ostium secundum type of atrial septal defect (ASD) with bidirectional shunt [Figure 1]; dilated right atrium and ventricle; concordant ventriculo-arterial connection (aorta arises from the left ventricle and pulmonary artery arises from the right ventricle); intact interventricular septum; normal biventricular function; and mild to moderate tricuspid regurgitation. Mitral valve was thick, pliable with commissural fusion and doming of anterior mitral leaflet [Figure 2]. Moderate pulmonary regurgitation was present and mean pulmonary artery pressure was 35 mm of Hg. 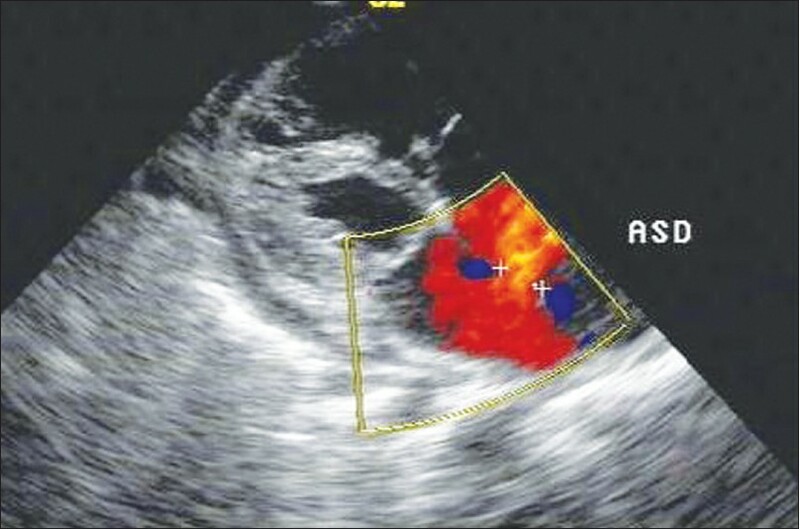 Mitral valve area was 1.60 cm [Figure 3]. Tricuspid, aortic and pulmonary valve were normal. There was no evidence of patent ductus arteriosus. Total anomalous pulmonary venous connection or coarctation of aorta. 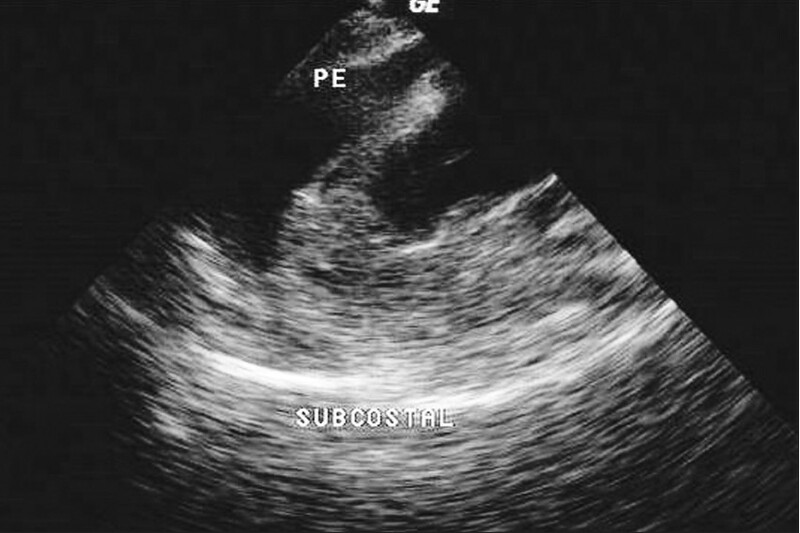 Mild to moderate pericardial effusion was present [Figure 4]. 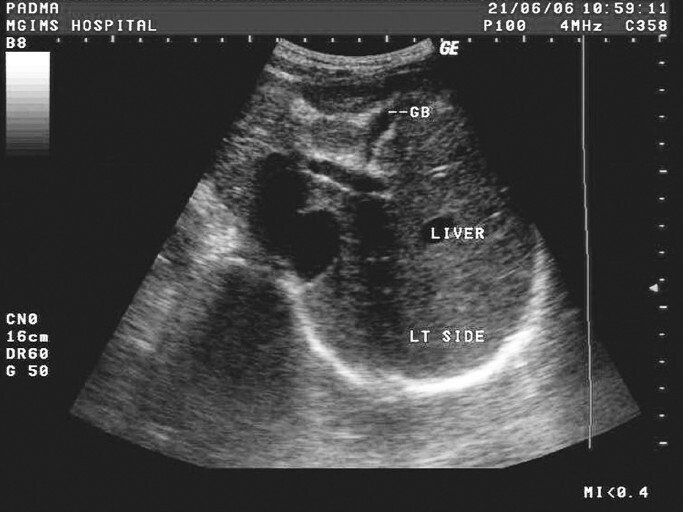 The patient also underwent an ultrasound examination of the abdomen which showed liver on the left side, confirming situs inversus [Figure 5]. Pericardiocentensis was done. Pericardial fluid was straw colored and had a protein (albumin) content of 3.2 g/dl and showed lymphocytosis consistent with tubercular pericardial effusion. The patient was started on antitubercular treatment. The normal position of heart is situs solitus and levocardia. Levocardia indicates that heart is mainly on the left of chest and its apex points to the left. On the other hand, dextrocardia indicates the heart is mainly on the right and its apex points to the right. Isolated dextrocardia usually displays situs solitus (stomach on left and liver on right). The extent of right rotation of heart in isolated dextrocardia is less than mirror image dextrocardia which is situs inversus. Situs inversus viscerum is a rare congenital anomaly in which there is general transposition of viscera due to reverse rotation including heart which rotates to the right side called as dextrocardia. In situs inversus, viscera which are normally present on the right side (e.g. liver, appendix, duodenum) are situated on the left, while viscera normally present on the left (e.g. spleen) are situated on the right side. There have been numerous reports ,,,, till date describing the presence of rheumatic MS with dextrocardia and/or situs inversus. The rheumatic MS in cases of dextrocardia and /or situs inversus poses a challenge in surgical management, especially percutaneous procedures. Rene Lutembacher (1884-1936), a French cardiologist, described Lutembacher's syndrome in 1916. Another reference of Lutembacher's syndrome was made in 1865 when Martineau reported the first case. Perloff in 1970 did a contemporary reappraisal and suggested the MS to be rheumatic in origin. Till date, we could not find a reference of situs inversus with dextrocardia with Lutembacher's syndrome. Our case may be the first of its kind. Our case describes the presence of situs inversus with dextrocardia, Lutembacher's syndrome, and pericardial effusion. It is needless to say that the pericardial effusion in our case was acquired and was tubercular in etiology. 1. Bopp P, Bussat P, Lemonnier J. Rheumatic heart disease and dextrocardia. Arch Intern Med 1964;113:19-22. 2. Ma N, Jiang SL, Huang LJ, Zhao SH, Xu ZY, Ling J, et al. Diagnosis of isolated dextrocardia using angiocardiography or surgery. Chin Med J (Engl) 2004;117:1655-8. 3. Hussain S, Ahmed W. Percutaneous transvenous mitral commissurotomy in mitral restenosis with situs inversus. J Coll Physicians Surg Pak 2009;19:117-9. 4. Namboodiri N, Harikrishnan SP, Ajitkumar V, Tharakan JA. Percutaneous mitral commissurotomy in a case of mirror-image dextrocardia and rheumatic mitral stenosis.none J Invasive Cardiol 2008;20:E33-5. 5. Verma PK, Bali HK, Suresh PV, Varma JS. Balloon mitral valvotomy using Inoue technique in a patient of isolated dextrocardia with rheumatic mitral stenosis.none Indian Heart J 1999;51:315-7. 6. Chow WH, Fan K, Chow TC. Balloon mitral commissurotomy in a patient with situs inversus and dextrocardia.none J Heart Valve Dis 1996;5:307-8. 7. Patel TM, Dani SI, Thakore SB, Chaq MC, Shah SC, Shah UG, et al. Balloon mitral and aortic valvuloplasty in mirror-image dextrocardia. J Invasive Cardiol 1996;8:164-8. 8. Martineau. Sur un cas de retrecissement mitral avec persistence du trou de zbotal. Bull Soc Dsc Med 1865;12:202.9. 9. Olivares-Reyes A, Al-Kamme A. Lutembacher's syndrome with small atrial septal defect diagnosed by transthoracic and transesophageal echocardiography that underwent mitral valve replacement. J Am Soc Echocardiogr 2005;18:1105. 10. Innerfield I. Lutembacher's syndrome associated with dextrocardia. Arch Intern Med 1950;85:490. 11. Rowell NR, Still WJ. Isolated dextrocardia associated with Lutembacher's syndrome. Am Heart J 1958;56:60-3. 12. Owen SA. A case of complete transposition of viscera, associated with mitral stenosis; including a description of the electrocardiographic tracings. Heart 2003;113:1911-2. 13. Malhotra V, Singh S, Singh A. Pericarditis complicating congenital dextrocardia with Situs inversus. Indian Heart J 1970;22:41-6. 14. Lansing AM, Scofield EL. Mitral valvotomy in a patient with dextrocardia and Situs inversus. Chest 1974:66:580-2. 15. Said SA, Veerbeek A, van der Wieken LR. Dextrocardia, Situs inversus and severe mitral stenosis in a pregnant woman: Successful closed commisurotomy. Eur Heart J 1991;12:825-8. 16. Raju R, Singh S, Kumar P, Rao S, Kapoor S, Raju BS. Percutaneous balloon valvoplasty in mirror image dextrocardia and rheumatic mitral stenosis. Cathet Cardiovasc Diagn 1993;30:138-40.